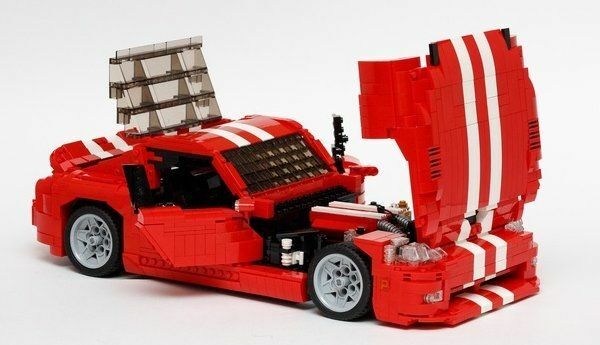 Lego has introduced a handful of large scale car kits in the past few years, including a variety of Ferrari, Porsche and McLaren race cars and there is a COPO Camaro, Ford Mustang and Ford SVT Raptor F150 kit on the way. Thanks to the Lego Ideas program, there could soon be a Dodge Viper Lego kit in the Lego Speed Champions series and if you want to help make the Lego Viper a reality, you can do so simply by signing up on the special website and answering a few questions. The Lego Dodge Viper was created by Ben P Smith, who spent roughly 250 hours designing and building this 2nd generation Viper GTS Coupe from the ground up. Smith began in August and finished in December, basing his build on detailed images of the actual Dodge Viper inside and out while ordering the individual pieces needed to build the car from BrickLink along the way. In total, roughly 2,000 pieces went into building this beautifully detailed Dodge Viper GTS Coupe and the resulting model car is roughly 1:12th scale of the real American supercar. Once he had completed the build, Ben Smith submitted his Dodge Viper to the Lego Ideas website and, if it receives enough consumer report and management approval – it could join the current Lego Speed Champions series. Considering the popularity of the Dodge Viper in the toy and collectable world, I would be shocked to see this kit fall short of 10,000 supporters or being rejected by the Lego brass. Of course, marketing the Dodge Viper Lego kit would also mean working out a deal with the Chrysler Group, which brings money into the issue so it is more than just a business case and consumer support…but there is hope for those hoping for a Lego Viper. Lego Ideas allows dedicated Lego designers a chance to build an all-new kit from scratch and submit it to the Lego community for their approval. If a submitted Lego Ideas build receives 10,000 supporters, it goes to a phase of management consideration and if the company sees a good business case for the kit – it gets the green light for production. If you want to support the Dodge Viper Lego kit, it is very easy. When you visit the Lego Ideas website (by clicking here), you can click the “Support” button and if you are not already registered, you only need to create a username and verify your login via email. From there, you are asked how many sets you think that average Lego fan might buy, how much you think that kit should cost and how hard you think the Dodge Viper Lego package shown would be to build. When I signed up to support the Lego Viper earlier today, I was the 177th person to do so, but the kit has 344 days left to hit the required 10,000 supporters. If you are a Lego fan or a Dodge Viper fan and you want to see the Viper Lego kit on your shelf at home, sign up to support Ben Smith’s kit and while there, check out some of the other cool kit ideas submitted to Lego Ideas. Even if you don’t want to sign up to support the Lego Viper, you can find lots more pictures and details on the build in the support link above! This is pretty cool! I voted for Viper!